Many would say that the demise of the two-seater was onset by the number of popular hot hatches, which have become increasingly more powerful and quite pricey to buy. Now, the new Abarth 124 Spider - a modified version of the Mazda MX-5, promises to resuscitate the back to basics roadster at a price that won’t break the bank. It may well be the sister car to the Mazda MX-5 (which earned its status as an uncomplicated roadster in Britain), but Fiat/Abarth say that this new car doubles the number of entry-level sports car on sale. Marking the return of the ‘spider’ badge, and being the natural heir of the original model launched in 1972, the 2016 car incorporates performance, technology and iconic Italian style as the key factors of a very successful line-up. Priced with a starting price £29,565 OTR for the six-speed manual version, the new two-seater roadster represents outstanding value for money. The carmaker has amalgamated simple old-school sports car charm with some serious performance. What you get is a powerful four-cylinder 1.4-litre MultiAir Turbo engine, delivering 170 hp and 250 Nm of torque. With a top speed of 143 mph the car can go from 0 to 62mph in 6.8 seconds. Furthermore, as the sound of the engine really matters in an Abarth, the Record Monza exhaust comes as standard, generating a unique growl. The automatic version of the Abarth 124 Spider starts at £31,605 and features a steering wheel-mounted paddle shift, which exploits all of the engine’s torque. Each car is tested and certified by an Abarth technician who applies a metal plaque showing the sequential number of each car to certify the exclusiveness of the Abarth 124 spider: it’s a unique number for a unique customer. The black bonnet and boot is a reference the successful Abarth 124 Rally of the early 1970s but there are five body colours available, which signify sport and heritage. The new Abarth 124 spider has a three-gauge instrument binnacle featuring a large central rev counter, a speedometer on the right and a data display on the left allowing the driver to monitor all key driving information at a glance. Standard equipment includes climate control system, cruise control, adjustable, electrically-folding door mirrors, and an infotainment system with ergonomic, selector dial on the centre console. The system features a 7-inch colour display, DAB digital tuner, MP3 player, two USB ports, AUX input, and Bluetooth connectivity. There is also a stereo with four speakers while, for superior sound quality, a Bose premium sound system with nine speakers, including dual headrest speakers on both seats and a subwoofer, is available as an option. A satellite navigation system is also optional. 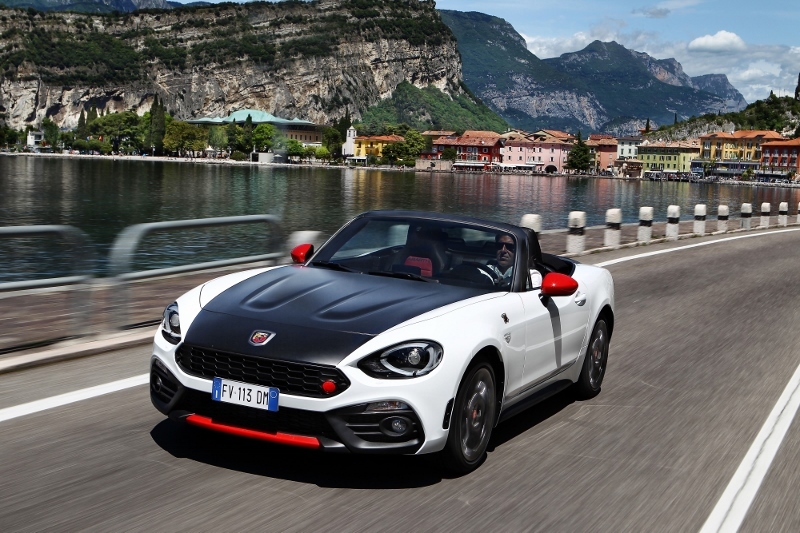 “The 124 spider is a new car and a new chapter in the exciting Abarth story,” says Gerry Southerington, Abarth brand manager. “It’s what many of our existing customers have been waiting for, and I am confident we will now welcome a new group of owners into the Abarth family.